Today is going to be a busy day at the office. We have sales meeting for the Dallas staff, making sure all the sales meeting stuff is ready for Portland and mainly just making sure we have packed everything. After sending 2 – 18 wheelers full of booth stuff I would hope we didn’t forget anything. This time of year is kind of like Christmas. to find out you need 4 – C batteries that Santa did not include with the package. Well, setting up a booth for 40 sales people is much the same. If we have forgotten anything at this point we could probably blame it on Santa. but now it is time to pack my own suitcase. The first day of the show we tell all the sales reps what color to wear for our annual group picture. 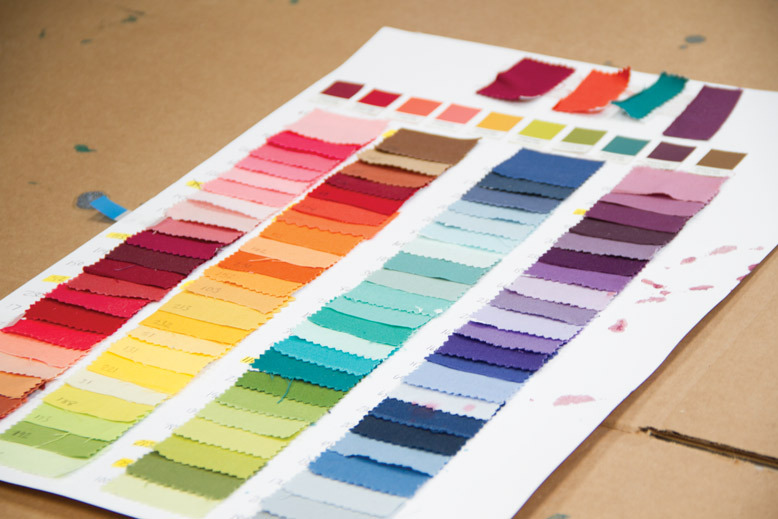 Months ago we sent them the color palette for the booth. We did narrow down the choices to 10 different Bella colors. It does always seem like these are colors that are not readily available in my closet. I know, I know picking booth colors in all black or all brown would be a bit drab. Check back for our group picture to see how well we all follow fashion directions. 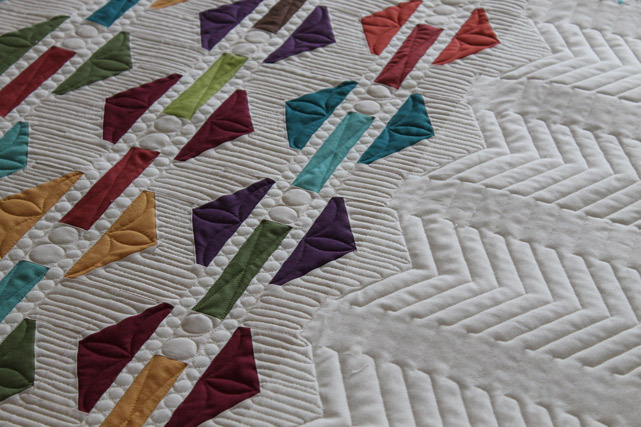 The quilting on the hexagon quilt is fabulous!! The quilting is simply beautiful.Have a great time at Market! I always look forward to pictures of the Moda booth! can't wait to see what the theme is this year! Have fun and take lots of pictures and video's to share! having had an opportunity to see your booth a couple of times in person, I am seriously impressed by the amount of work your company does for those shows. Have fun in Portland! I'm so sad to not be there this time! I'll miss seeing the amazing Moda booth and all the great new lines. 🙁 Post lots of pictures!